But while the rule of law has been eroding in the United States, the good news is that we still rank in the top 20 in a new ranking from the World Justice Project. Here’s how the WJP describes the importance of the rule of law. And here’s a map showing the 113 nations that are included in the rankings. All you need to know is that it’s good to be light-colored and bad to be dark-colored (though the map is a bit confusing since nations that aren’t ranked – much of Africa, for instance – also appear as light-colored). One of the obvious conclusions is that the western world (Europe, North America, some nations in the Pacific Rim) does the best on protecting, observing, and maintaining the rule of law. Simply stated, western civilization is superior. But what can we learn by specifically examining the rule of law in developed nations? What’s immediately apparent, if you look at the ranking of high-income nations, is that Nordic nations score very well. This is one of the reasons, I’ve explained, that they have a higher ability to tolerate and endure a large welfare state. Germanic and Anglo-Saxon nations win the proverbial silver and bronze medals. 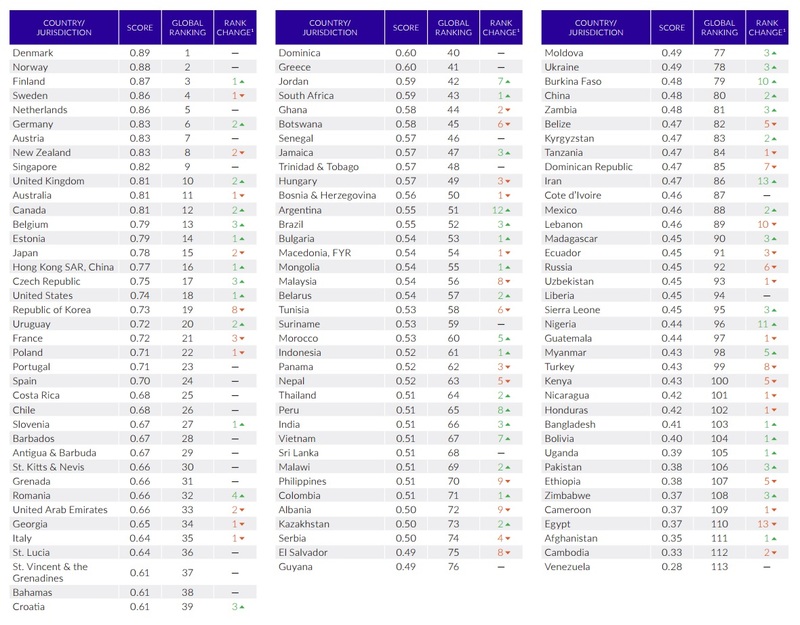 Looking at the rest of the world, I’m also not surprised to see strong scores for free-market success stories such as Singapore, Estonia, Hong Kong, and Chile. Let’s close by taking a closer look at the data for the United States. Among high-income nations, America gets a decent score, but it’s nothing to celebrate. Indeed, we actually do poorly when compared to other Anglo-Saxon jurisdictions. In the above excerpt, I included the list of eight categories that are used to rank nations. Now let’s look at how America scores in those areas. At the risk of oversimplifying, we do well in two areas. There are reasonably strong constraints on government powers and a reasonable degree of openness and transparency. On the other hand, we don’t do very well (particularly when compared to other high-income nations) for areas related to the judicial system. Though I shudder to contemplate the scores America will receive after four or eight years of Hillary Clinton. P.S. Is anybody surprised that Venezuela is in last place? 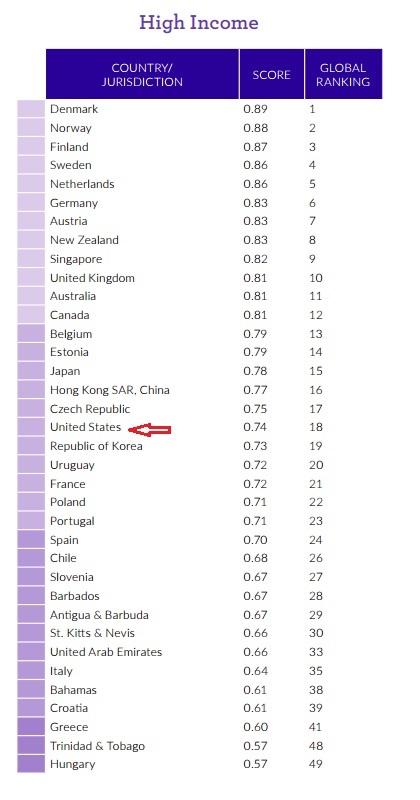 Though I suppose I should repeat my caveat from earlier in the month that hellholes such as Cuba and North Korea would probably rank lower if they were included in the rankings.